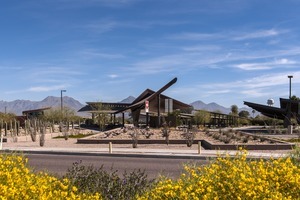 PHOENIX, Dec. 31 /CSRwire/ - Balfour Beatty Construction’s North Scottsdale Park and Ride project in Scottsdale, Ariz. has been recognized by Engineering News Record (ENR) Southwest as the 2014 Best Green Project. A leading example of sustainability, the project incorporates many features designed to achieve net-zero energy use, including solar panels that also provide shade for vehicles, LED site lighting, and pervious concrete pavement that helps mitigate the heat island effect and better manages storm water. The award entry was submitted by one of Balfour Beatty’s partners, lead designer DWL Architects + Planners to ENR’s Best Projects competition which honors the best construction projects of the year located throughout the Southwest, including Arizona, Nevada, and New Mexico, as well as the companies responsible for their design and construction. Industry leaders judge the projects based on safety, innovation and teamwork, among other criteria. View the full list of ENR’s Southwest 2014 Best Project award winners. Balfour Beatty Construction was also honored with the Metal Construction Association’s 2014 “MCA Chairman’s Award” in the metal roofing category for the North Scottsdale Park and Ride project. As part of the annual Metal Architecture Design Awards, this annual competition recognizes outstanding building projects involving metal construction including overall appearance, significance of metal in the project, innovative use of metal, and the role of metal in achieving project objectives. View the full list of MCA’s 2014 Chairman’s award winners. Featuring a wing-inspired canopy, the 5.8-acre park and ride consists of 275 design-build shaded parking spaces for passengers and commuters, a covered passenger platform, and a security building. Specific project highlights include photovoltaic panels attached to parking structures, and a pervious concrete drainage system to minimize retention and maximize parking. Metal roofing and panels complement the aesthetics and design of the building, drawing on the versatility to evoke thoughts of flight, wings, and birds. Additional on-site amenities include water fountains, vending machines, plasma-cut metal benches, and clever bicycle racks that decorate and serve the needs of cycling commuters. The project was also recently awarded the “Excellence in Masonry Architectural Award” from the Arizona Masonry Guild in 2014. The project architect is DWL Architects + Planners, Inc.
An industry leader for more than 80 years, Balfour Beatty Construction Services US provides general contracting, at-risk construction management, and design-build services for a wide variety of markets, serving clients in both the public and private sector. With more than 3,000 employees across the U.S., the company has been cited as a Top 10 Domestic Building Contractor and Top 10 Green Builder by Engineering News-Record. The company is part of London-based Balfour Beatty plc (LSE: BBY), a global infrastructure services business operating in more than 80 countries, with a worldwide commitment to providing assets that help societies function, develop, and thrive. To learn more about the company, visit http://www.balfourbeattyus.com/ or look for BalfourBeattyUS on Facebook, Twitter, and LinkedIn.